Longer lifespans mean the world is getting older and we will soon have more people of non-working age than children. People are already moving from single lifelong careers to a portfolio of experiences, abandoning linear progressions in organisation for matrix career progression that fit a longer working life. The skill shortage continues to trouble many business leaders and politicians who are concerned about the impact a skills shortage could have on company growth and we are always looking for candidates who can adapt quickly to changes in technology and the economic environment. Clients consistently tell us how much they value soft skills such as problem solving, adaptability, creativity and innovation. These are hard skills to find and as technology forces businesses to change faster and more frequently, these skills are in demand. As business leaders and CEOs change their talent strategy to focus on transferable skills and adaptability, we are responding by highlighting them in candidates. In order to attract talent with these high level skills, organisations are becoming open to new ways of working. While this doesn't mean the end of full-time, permanent roles, by 2019 a greater proportion of workers can expect to choose agile work opportunities. More candidates expect to work from home, part-time, or have access to flexible scheduling. Flexible work arrangements will remain key to employee attraction and retention, and companies will expand their agile talent pool by using temporary resources and bringing in specialised consultants to tackle big projects and important initiatives. 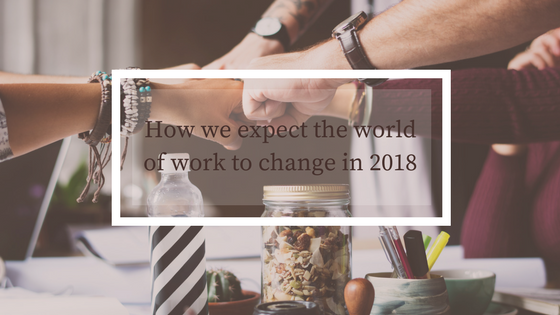 In 2018 we still face uncertainty as Brexit negotiations unfold, making some organisations hesitant about taking on full time, permanent IT staff. As the technology landscape changes, organisations are also still debating what they need to do to meet regulatory changes and tackle the rapid expansion of cyber crime. The development of the Internet of Things (IoT), the growth of AI and machine learning, and the shift to cloud technology means businesses need to ensure they have the right expertise. It's no longer a question of employing someone who can operate and manage a specific system, but of finding someone with the IT know-how to allow a business to transform itself significantly through the latest tech. IT contractors who are exposed to global tech developments from a wide range of suppliers provide this expertise and can give organisations a competitive edge in challenging markets. When EU General Data Protection Regulations (GDPR) come into force 25 May this year, companies will be held accountable for failing to protect personal data. Personal data is a vast area, covering anything that is identifiable – not just by name. Addresses and dates of birth, social security and tax numbers, gender, social and cultural factors all fall under protection by GDPR. Documents such as CVs, or the information a candidate might fill in during the interview process, are a prime example of confidential data protected under GDPR. This means recruiters and employers must prepare for GDPR. From auditing data, to assessing data security, removing data you no longer require, and backing up data you do, the requirements are extensive. As data protection and data security make us consider our responsibilities, GDPR will change the way we all work. Continuous Learning will play a more significant role in all sectors, but particularly in areas where skills are rapidly changing such as science and information technology. This will be relevant for candidates, employees, and at a board level, with directors having to develop their understanding of cyber security and AI ethics in order to debate key developments in their companies. A university education may be one way into a career, but Continuous Learning is the way to stay in it, developing your knowledge and skill set to make the most of new opportunities. Should your career become obsolete – something that may happen as AI takes on more roles– Continuous Learning will help you move into a new career. While some training will be covered by employers, people will be expected to take responsibility for their own development paths, focusing on areas of interest that may become more significant to a career as the world moves on. Just as many of us pay into private pensions, a private Continuous Learning fund may prove to be a good investment when your specific expertise starts paying dividends. "It is not the most intellectual that survives; it is not the strongest that survives; but the one that is able best to adapt and adjust to the changing environment in which it finds itself"